The Interwell Packaging solutions – Extremely strong but still lightweight. Packaging and transport of industrial products is done effectively only with an overview of needs throughout the supply chain. 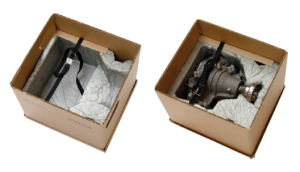 Interwell industrial packaging solutions will provide this customized packaging at the same time focusing to reduce overall company costs. Interwell represents a new business area for Lamiflex that allows us to offer unique and innovative packaging solutions and services to a wider range of segments, including the manufacturing, pharmaceutical, IT & Telecom industries. The unique Interwell product represents another step towards broadening our business goals. With our deep knowledge of packaging solutions, this is a natural step that we can take together to create new opportunities. Interwell is a patented product of environmentally friendly hardened corrugated cardboard. This product combines the benefits of being lightweight, fully recyclable, flexible with a good price point and the positive characteristics of the plywood in terms of strength, stackability and buoyancy. In other words, an extremely strong yet thin light weight material. It reduces transportation costs and the environmental impact. It is easy to handle and there are unlimited opportunities to create a suitable application.